I just read “Constitutionalism”: The White Man’s Ghost Dance, and would like to express myself on the subject, and cite some cases I am familiar with that pertain to the same basic subject. I know a couple of people who each have their own legal cases. One is suing the City, including Jerry Brown (a Jesuit). This is being done in pro per for now, using Common Law pleadings that invoke God, and the Court does not understand. The other wants to sue an international accounting firm for destroying his business in 1997, after he had gone Public, and the firm had made errors on company’s actual worth. So the State shut him down. He consequently sued in Court, and lost his case in 2000. He now wants to do a Common Law Court of Record, and has spent the last five months, sequestered in his house, learning all he can about Common Law Court of Record; he’s also a champion of the Magna Carta. He even purchased Bill Thornton’s videos, and communicated with him via email (I read the email), but Thornton refused to cite ANY cases he has ever won. Hmm. I also know two other people who declared themselves sovereign citizens, and continued to drive their automobiles without a license or registration. Both had their autos confiscated, and sold at auction. One rides a bicycle now. What these people don’t understand, and what I’ve learned, is that the Roman Vatican laws rule. The Roman Vatican laws are a part of the ROOT of evil that rules the world; make no mistake about that. The ROOT is the cause of all evil in the world, and has ruled for thousands years. Finally, no man, or woman will be really FREE until that ROOT is dead. You can take that to the bank, which you had better hurry and do before that ROOT collapses the financial system as well. 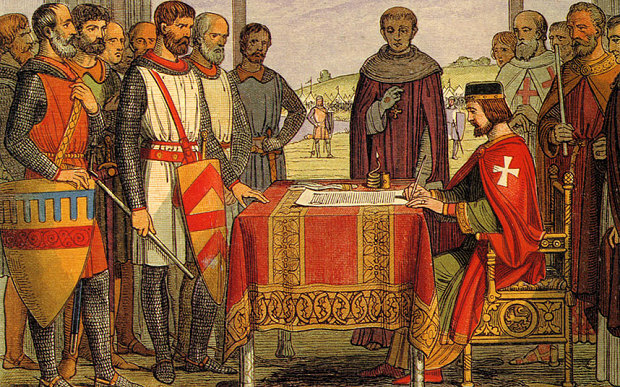 Constitutionalists revere the Magna Carta, but if they were to read it, they’d be baffled. Expecting to find, as libertarian Constitutionalist Ken Krawchuk says, “many of the rights we still enjoy today,” they’d find themselves adrift in an alien, feudal world of “aids,” “wardship,” “scutage,” “knight service,” “reliefs,” “wainage,” “castle guard,” “socage,” “burgage,” and other arcana even medievalists toil to comprehend. Magna Carta — extorted from King John by a few dozen rebellious barons in 1215, a dead letter within three months, voided by England’s feudal overlord, the Pope — did almost nothing for almost all of England’s two million people. It confirmed or created privileges for churchmen and barons, occasionally for knights, and in only two instances for “free men.” Most Englishmen were villeins, not freemen. And as historian Sidney Painter has written, “Whenever provisions of the Charter seem to benefit the ordinary man, a close examination will show that it is his lord’s pocketbook that is the real cause of concern.” It was only a question of who would do the fleecing. The Great Charter has nothing to say about free speech, unreasonable searches and seizures, self-incrimination, the right to bear arms, free exercise of religion, the obligation of contracts, ex post facto laws, bills of attainder, rights of petition and assembly, excessive bail, the right to counsel, cruel and unusual punishments, indictment by grand jury, etc., etc. Far from forbidding even involuntary servitude, it presupposes it (chs. 17, 20 and 23). Far from forbidding the establishment of religion, it confirms it in its very first provision (ch. 1). The real Magna Carta was not even remotely libertarian. Modern libertarian notions such as self-ownership, laissez faire, greatest equal liberty, the nightwatchman (minimal) state, even private property itself would have bewildered the signatories of Magna Carta. They understood liberties, not liberty; privileges, not property. The free market was a concept of the far future: “markets” were times and places where the government authorized buying and selling. Property rights were derivative and relative. Except for the king, nobody owned real property “allodially,” absolutely. Rather, title (ownership) was relative to other interests, and in theory always subordinate to the paramount claims of the king. Constitutionalists disparage legislation, but that’s all Magna Carta ever was, amendable and repealable like any other statute. By 1992, only three of its 63 provisions were still on the books. In the guise of declaring custom, Magna Carta changed the law, violating what Constitutionalists consider the Common Law. They cherish the county, for instance, to which the sheriff was answerable (they suppose) — but the Charter forbid sheriffs and other local officials from hearing the pleas of the Crown (ch. 24). It is as if the President of the United States issued an executive order that felonies should be tried only in federal courts! As for this Common Law (cue the angelic chorus here), just what is it anyway? The term has at least a half dozen meanings. It might refer to English law as distinguished from the civil-law systems of Europe. It might be “law” as distinguished from “equity,” i.e., the law of the royal courts at Westminster distinguished from certain doctrines and remedies administered by a different royal appointee, the Chancellor. It might refer to judge-made rather than statutory law. Perhaps most often it refers to the law “common” to all Englishmen, the national law as opposed to the varied local laws enforced by manor and hundred courts, borough courts, and courts leet. Ironically, if there was ever a trace of truth to the Constitutionalist dogma that the people in juries “judged the facts and the law,” it was in the local courts outside the Common Law. And it was the law of these courts with which ordinary Englishmen were most familiar and which, as Julius Goebel argued, most heavily influenced colonial American law. As if “Common Law” were not a phrase already overburdened with meanings, Constitutionalists load on even more. They equate Common Law with Natural Law, with Natural Reason, with Christianity, and with common sense. Ken Krawchuk’s example is common-law marriage: “If a guy and girl live together for seven years, they’re married; it’s the common law. It’s plain common sense.” It’s neither. Mere cohabitation for however long a period never married anyone in England or America. There was no such thing as nonceremonial “common law” marriage in England at all. In America, where the practice developed, such a marriage required — not just shacking up — but also an agreement to marry and a public reputation for being married and/or the couple holding itself out as being married. The seven-year proviso is imaginary, and it isn’t common sense either. Why not six years and eleven months? Why not five years? A lot of legally solemnized marriages don’t last that long these days. Since when was common sense so dogmatic? Constitutionalists contend that the Common Law is based on (litigation over) real property — land. As their generalizations go, this one is not too far wrong, but it isn’t easy to square it with a conception of the Common Law as universal Reason. Under Common Law, real property descended to the oldest male heir — except in Kent, where partible inheritance among male issue prevailed, with the proviso that the youngest son inherited the household (“gavelkind”). Nowhere did land descend to any female if there lived a male heir, however remote the relationship. How is it that primogeniture is common sense everywhere in England except Kent?